Cafe Rico from Puerto Rico. It is an integral part of the puerto rican society. It's permanent public preference is owed to its better grains, perfect roast and a very careful elaboration. Its darker roast is preffered on the island. Enjoy it! 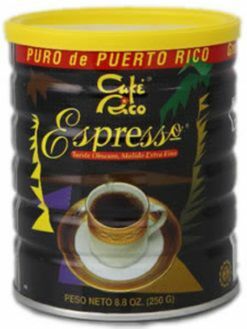 Cafe Rico from Puerto Rico available here at www.ElColmadito.com the Largest Puerto Rico Coffee Shop on the Internet.